It turns out, Vosburg was right. For the first time in the team’s history, the Crested Butte Lady Titans basketball team is headed to the 1A state tournament in Colorado Springs after defeating La Veta 57-53 in the regionals on Saturday, March 8. The Lady Titans entered the regional game against La Veta as the underdog. 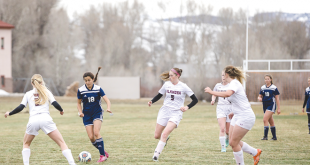 La Veta amassed a 20-1 record leading up to the regional game and was responsible for sending the Lady Titans packing last season at regionals. At the end of the first quarter this year, it appeared as if the Lady Titans were destined to fall, once again, one game shy of the state tournament. The game opened with the two teams trading baskets and Crested Butte in La Veta’s face from end-to-end. When La Veta’s defense shifted to double team senior Emma Coburn inside, Coburn managed to find junior Jessie Frame for a bucket and the Lady Titans were hanging on midway through the first quarter. La Veta responded, pushing the ball up the court to challenge Crested Butte’s speed and found players open inside to build an 11-point lead. “The level of playing was a little bit higher than what we’re used to seeing and that kind of shocked us,” says coach MaryMike Haley. The Lady Titans’ hustle on defense forced a number of turnovers in the second quarter, but they failed to convert on offense, throwing the ball away at inopportune times. La Veta built a 28-14 lead midway through the second quarter but the Lady Titans refused to fold. Junior Mackenzie Mailly battled for every loose ball crashing the lane on offense and lunging for steals on defense. Mailly’s hustle resulted in buckets from Vosburg and Coburn, and when junior Allie McFarland pulled down an offensive rebound and scored, the Lady Titans had cut La Veta’s lead down to five points with a minute left in the half. La Veta responded to close the half with five straight points, taking a 33-23 lead into halftime. Haley kept her comments brief at halftime, reminding the team that the game was well within their reach. The second half opened much like the first half with the two teams trading off baskets. Mailly hit a 10-foot jumper, Coburn scored inside and Vosburg hit her first three-pointer of the game to pull within five of La Veta. La Veta pulled away once again 46-34 with two minutes left in the third quarter, but McFarland and Vosburg each scored and then the Lady Titans scored—what I believe to be their best basket of the season—to cut La Veta’s lead in half. Coburn carried the ball up the sideline and found junior Kaitlin Councilman open with a pass crosscourt. Councilman looked to shoot, drawing a defender, and slipped the ball inside to Vosburg for a lay-up, forcing La Veta’s coach to call a timeout. La Veta came out of the timeout determined to end the quarter strong, but another offensive rebound and basket from McFarland held La Veta in striking distance as the two teams took the court for the fourth quarter. Vosburg broke free from the heavy pressure to open the fourth quarter with eight points, including two three-pointers. Coburn sank a four-foot jumper, and for the first time in the game the Lady Titans were on top 52-50. Incredible defense from the Lady Titans held La Veta scoreless on six straight possessions and Coburn scored another two for her team, the leading scorer with 28 points, to put the Lady Titans up 54-51 with just over two minutes left in the game. La Veta scored to pull within one and pressured the Lady Titans into a turnover with 30 seconds remaining. But the Lady Titans defense proved the difference once again and stole the ball back, forcing La Veta to foul Coburn, sending her to the line for the one-and-one with 18 seconds left. Coburn stepped to the line coolly and sank both shots, essentially icing the win. La Veta’s desperate attempt at a three-pointer missed and Vosburg hit one of two free throws with one second left for the 57-53 win. Haley credits some key input from assistant coach Paul Holder in the first half and down the stretch as an integral part of the win. The Lady Titans head to Colorado Springs as the sixth seed out of eight teams and will face eastern plains school Haxtun on Thursday, March 13 at 3:30 p.m. at the Air Force Academy. Haxtun is a mystery to the Lady Titans, so Haley will get the team ready the only way she knows how.